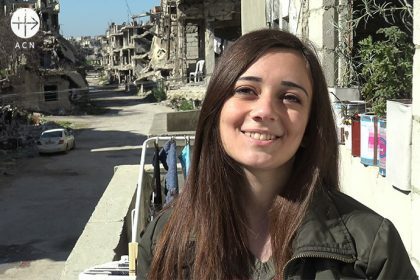 AN action plan to enable thousands of Christians to return to their homes in the Syrian city of Homs was agreed in a house-repair scheme involving Church leaders and a leading Catholic charity. 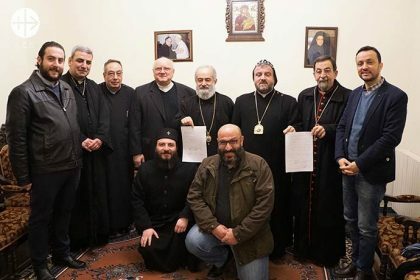 At the meeting in Homs, the leaders of five Church communities signed the Homs Reconstruction Committee agreement, in which Catholic charity Aid to the Church in Need will repair 300 homes as part of the first stage of the plan. In the second phase, a further 980 homes are due to be rebuilt – 80 from the Melkite Greek Catholic community, 600 Greek Orthodox and 300 belonging to Syriac Orthodox families. 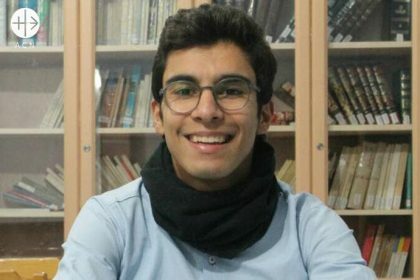 ACN will support part of the project. 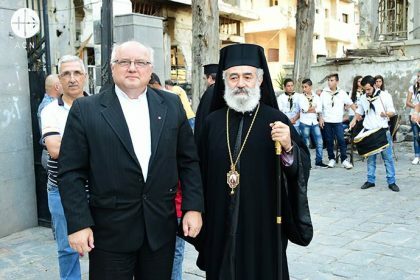 Highlighting the significance of the agreement, ACN Middle East projects coordinator Father Andrzej Halemba said: “The agreement is one of the most critical steps forward in the recovery of the Christian community in Homs. Metropolitan George Abdou Zakhem (on the right) greeting the faithful who came for the feast of the Exaltation of the Holy Cross. On the left: Fr. Dr. Andrzej Halemba. Melkite priest Father Bolos Manhal said: “I am very happy that people have this wonderful opportunity to return to their homes. They have suffered so much and for many coming home will be a dream come true. ACN will be contributing a maximum of US$3,500 towards each house being repaired. 13 February 2019, when the foundation document of the Homs Reconstruction Committee was signed in the city of Homs. 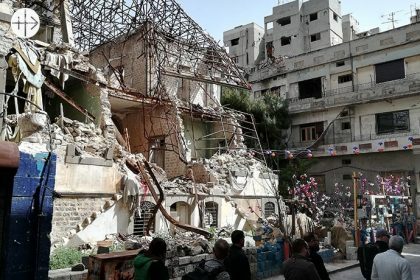 This ecumenical body created to overview the reconstruction of Christian houses in Homs was created by the leaders of five Church communities and ACN. With more than 12,500 homes destroyed in Homs and 37,500 badly damaged, many Christians have been living in displacement in the nearby Valley of the Christians for up to seven years. 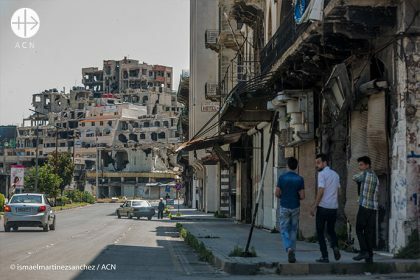 At the height of the conflict in 2014, there were less than 100 Christians remaining in Homs Old City and targeted attacks by Islamist extremists forced nearly 250,000 to leave. Last year, ACN piloted a scheme to repair 100 homes belonging to Melkite and Syriac Orthodox families, of which 85 are already reoccupied and the rest due to return at the start of the new academic year in the autumn. 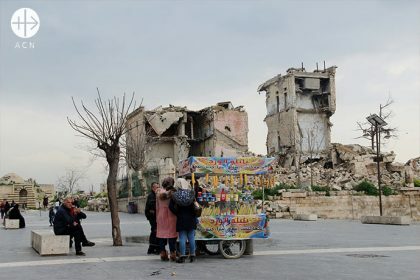 The 2018 Homs renovation plan was part of a scheme which has already led to the repairs of nearly 500 homes across Syria, of which many are in Aleppo. Since the crisis in Syria began in 2011, ACN has completed 750 projects involving 150 partners. 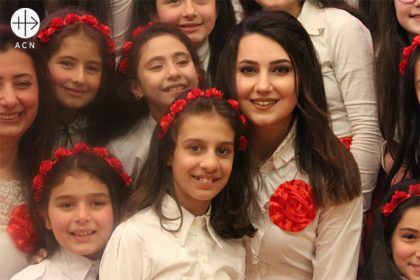 Christian families in Syria forced from their town by extremists celebrated their return on Thursday, 14th February with a ceremony marking the reconstruction of their homes. At the service, parishioners packed into St Mary’s Church, in Krak des Chevaliers (Al Husn) village, and received ‘Jesus is my Rock’ stone tablets and bottles of holy water to signify the completion of repairs to houses devastated during a two-year campaign of violence at the height of the war. 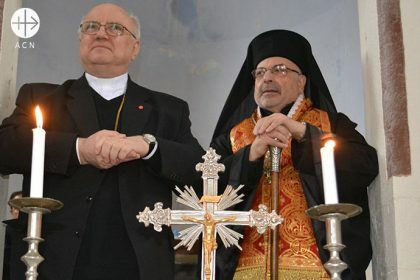 Presiding at the ceremony, Greek Catholic Melkite Archbishop Nicolas Sawaf of Lattakia, thanked Aid to the Church in Need, which funded the programme to repair 55 houses. Father Andrzej Halemba (ACN Middle East Projects Coordinator) and Greek Catholic Melkite Archbishop Nicolas Sawaf of Lattakia. He said: “Given everything that the people have suffered, the violence and the hatred, who would have thought these houses would be constructed? Among those who received a tablet was Hasan Marmari, 60, who returned to his home a few weeks ago after ACN completed repairing it. 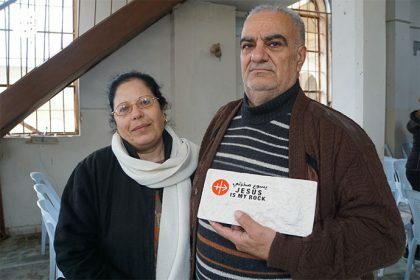 Homecomers Hasan Marmari and his wife Halloun Jreij with the Jesus is my Rock stone tablet. The Christian area of Krak des Chevaliers village came under attack in 2012 when extremists, including Muslims in the district, turned on them as part of the rebels’ campaign to take the nearby medieval Crusader castle, of crucial strategic significance as they sought to gain a stranglehold over the region. As well as repairing the houses, ACN restored St Mary’s Church, which dates back 900 years and which was badly attacked and desecrated during the violence. 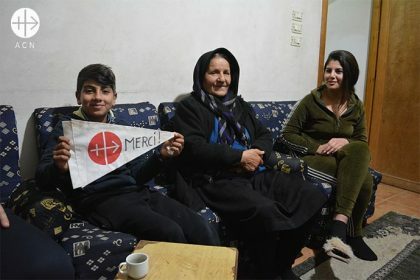 Since the conflict began in 2011, the charity has completed nearly 750 projects in Syria, such as emergency help for displaced Christian families in the Valley of the Christians, which includes Krak des Chevaliers village.